Knowing where to start or just how to choose a wedding dress when you get engaged can be overwhelming. This is the most important dress you will ever wear, own, and treasure and there are many factors to consider when choosing a bridal gown. But you may also consider choosing a wedding gown that will not only look beautiful on your wedding day, but for long afterwards. Perhaps a sister, daughter or even grand-daughter will wear your wedding dress someday. But, even if your gown is not worn again, it will be a treasured keepsake for you and your children if properly selected and cared for. Some fabrics are very delicate and snag easily. Other fabrics are very durable and can even be wet cleaned. If you are planning an outdoor wedding where there will be a chance of mud, slivers from wooden decks, and or grass stains, you may want to consider choosing a wedding gown that is durable. 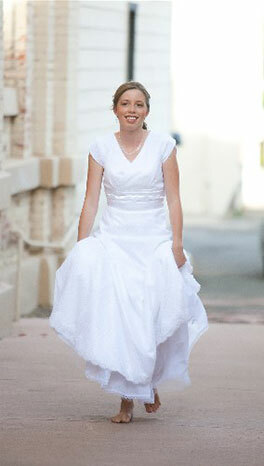 Consider a polyester dress of a stable weave, like polyester bridal satin, that can be wet cleaned. Delicate and/or sheer fabrics may not hold up as well to outdoor activities. Silk, rayon and acetate all need to be dry-cleaned, and mud and other outdoor messes may not come completely out of your white dress. Silk and nylon fabrics have a tendency to yellow more than other fabrics. Nylon can be wet-cleaned, so a whitener may be able to remove some yellowing for future use. Preserving your wedding dress right after a wedding will help protect your gown from yellowing and/or other deterioration. 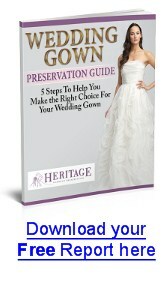 Get your instant, online quote for your wedding gown cleaning and preservation.